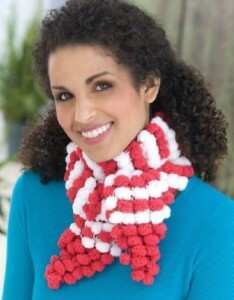 Scarf measures 4″ x 46″, or desired length.  RED HEART® “Spark-a-Doodle™”: 1 Ball each 9901 Reddy A and 9001 White Cloud B.  Knitting Needles: 5.5mm [US 9]. KFB = K into front and back of next st.
 For color changes, do not cut yarn; instead, carry unused yarn along edge of scarf.  When working with Spark-a-Doodle™, work sts with yarn between pompoms. Do not pull pompoms through sts. With A, make a slip knot. Row 1: KFB – 2 sts. Rows 2, 4, 6, 8, 10, and 12: K across. Row 3: KFB, K to end – 3 sts. Rows 5, 7, 9, 11, 13: Repeat Row 3 – 8 sts. Rows 14-15: With B, K across. Rows 16-17: With A, K across. Repeat Rows 14-17 until Scarf is 42” long, or desired length. Next Row: With A, K2tog, K to end – 7 sts. Repeat last 2 rows until 1 st remains on needle. Fasten off. Weave in ends.